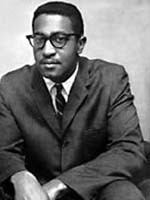 Franklin McCain, who spent much of his childhood in Washington, D.C., graduated from North Carolina A&T State University in 1964 with a degree in chemistry and biology. While a student, he roomed with David Richmond, a fellow member of the Greensboro Four – the room they shared was right down the hall from that of Joseph McNeil and Ezell Blair, Jr. Though he had been taught by his grandparents that the world was full of opportunities for him, he quickly learned that the color of his skin was more limiting than he anticipated, which he said made him very angry and feel the need to act. McCain currently lives in Charlotte, North Carolina with his wife Bettye Davis, where he worked as a chemist and is not retired. In Charlotte, he has been instrumental in many spiritual and social reforms brought about in the area. Information courtesy of February One Documentary.